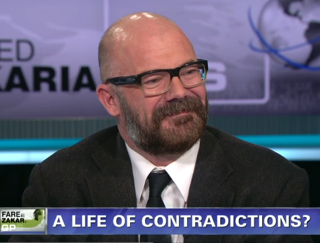 On Thursday, I wrote a piece exposing several factual errors in Andrew Sullivan's recent love letter to President Obama. Technically 7.8 percent is the same unemployment rate Obama inherited in January 2009, but in his first full month in office, February 2009, it was 8.4 percent and soaring. If something is "technically" correct, doesn't that mean it's correct? Not in Sullivan's Bizarro world. To make it false, Sullivan requires the clock to start ticking on Obama's presidency March 1, 2009, despite the former junior senator from Illinois being inaugurated on January 20. If that's the case, since Obama's stimulus bill passed in February of that year, can we all pretend it never happened and the roughly 50 percent of Americans that actually pay federal income taxes can get their money back? I doubt Sullivan would support that revisionism. The reality is that when it comes to economic data like unemployment, the clock begins on February 1 after a new president is inaugurated. I know liberals like to change the rules when it fits them, but that's the way it's worked for decades. As you can see, the unemployment rate in January 2009 when Obama took office was 7.8 percent. In September 2012, the number was the same. Please also notice the February 2009 number was 8.3 percent NOT the 8.4 percent Sullivan claimed. Interesting that even in his defense Sullivan can't get his facts straight. Color me very unsurprised. Second, the deficits have been shrinking, even though that's an incredibly hard thing to do when your revenues are in the toilet because of the recession. Check this graph out. Yes, let's check out that graph, shall we? Notice the name in the bottom right corner: "Steve Benen, Maddow Blog." That's the producer of MSNBC's Rachel Maddow Show writing at Maddow's blog at MSNBC.com. That's right. Sullivan actually used the producer of the Rachel Maddow Show as a source for federal budget information. Gives you a better idea, doesn't it? Now in fairness, the deficit has come down some from its 2009 peak of $1.413 trillion; fiscal 2012 has been initially reported as $1.089 trillion. But as the chart above reflects, this is up from the original $400 billion deficit projected in the 2009 budget before a Democrat-controlled Congress and two presidents decided to try to spend our way out of a financial crisis. 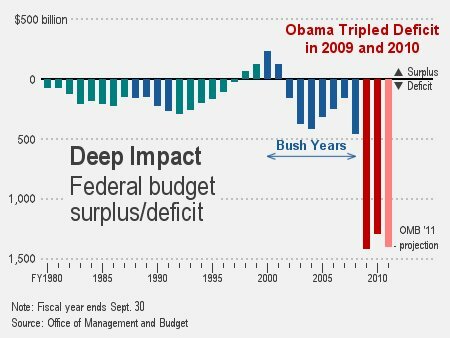 Please also bear in mind that Bush's last budget with a Republican Congress (fiscal 2007) produced a deficit of only $161 billion. Not surprisingly, much as Sullivan doesn't want Obama's unemployment record to begin when the object of his affection was inaugurated, he doesn't want the current White House resident's budget deficit numbers to begin then either. 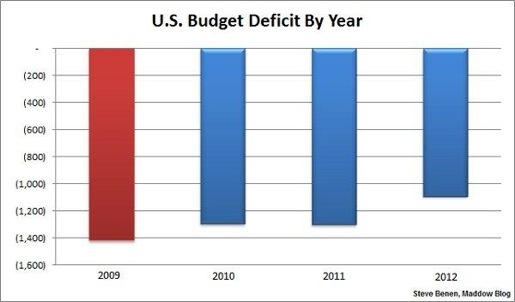 Instead, Obama's fiscal record should be judged from 2010 and compared to the deficit of 2009. This is the same sleight of hand Obama and his media minions have been performing for years to protect him from fiscal criticism. And what about the $787 billion stimulus bill that passed in February 2009 with just three Republican votes? Wouldn’t Obama only be blameless if he vetoed it and was later overridden? Of course he didn’t, and instead signed it into law on February 17. Nor did he veto the $410 billion of additional spending Congress sent to his desk three weeks later. Add it all up, and Obama approved every penny that was spent in fiscal 2009 either via his votes in the Senate or his signature as President. If all of this additional spending in 2009 was temporary and exclusively due to the financial crisis as Americans were told, our outlays should be back to the $3.1 trillion approved in June 2008 before the crisis began. If that were the case, we'd be looking at around a $600 billion deficit in fiscal 2012 (40 percent less than first reports) and only $200 billion in fiscal 2013. Because despite spending modestly declining in fiscal 2010, it rose in 2011 as well as 2012 and is expected to continue doing so for years to come according to Obama's Office of Management and Budget. In fact, OMB is projecting spending of almost $300 billion more in fiscal 2013 than what we spent in 2009 when we were supposedly making one-time stimulus outlays that weren't going to be recurring. Far from that, this spending became a new baseline from which new budgets would be based and spending increased rather than the one-time emergency measures we were promised. As such, claiming Obama shrunk budget deficits as Sullivan repeatedly does is completely absurd. Once again, color me very unsurprised.